In the service industry, you’re faced with tough challenges every day. And one of the biggest challenges is maintaining a stellar online reputation. A great review can make a huge impact on company morale (and bring in serious cash), while a negative review can feel like you might as well hand a stack of money directly to your competitors. Ouch. * BTW, if your online reviews are giving you cold sweats, we can help. But what you might not know is that when used correctly, reviews can (and should) be, your most powerful sales tool. That’s because reviews are your most powerful customer testimonial. And any salesperson worth their salt knows that customer testimonials create trust — which is essential to close deals. The more trust you build before the sale, the more likely your customer will see you as a trusted advisor, instead of someone just trying to make a buck. In fact, over 90% of customers will only buy from companies they trust. Luckily, if you’re using ReviewBuzz, you have a wealth of customer testimonials right in front of you — your reviews. The next step is to leverage the great reviews you’re getting to build more trust with your prospects and make it easier to drive sales. Introduce your team, along with their stellar reviews, to your customer before a service appointment to help establish your team as trusted advisors. Later on, when your team makes a sales recommendation, their status as a trusted advisor will make it easier to close the deal. When you display your online reviews directly on your website, customers are 58% more likely to give you a call. The ReviewBuzz Widget shows feedback on from your previous customers on many different review sites in one centralized location. Given that the average consumer reads 7 reviews before making a purchasing decision, keeping all of your great reviews on your website streamlines the decision making process for your customer. And making things easier on your customer will increase the likelihood that they give you a call and buy your services and products. Everyone is on Facebook. Seriously. More than 1 billion people have Facebook accounts. Your business listing on Facebook gets a lot of visibility from potential customers, and it’s a powerful way to to promote your reputation as a trusted business in your community. Even better? Facebook makes it simple to leverage your reviews to get more customers. When you get a great review, share it to your business listing on Facebook. Comment on the review and tag the customer to thank them for their excellent feedback — this makes it more likely appear to their friends (who could be your next customer) will see the review and remember you when they need help. And you can boost the post to get increase exposure of your business (and show off the great review) to people in your community. Sales calls are high pressure situations for customers and salespeople alike. The customer feels pressured to buy without doing adequate research, and the salesperson wants to close the sale, but hasn’t had enough time to develop trust. So why not use a Brag Book to help bridge the gap? 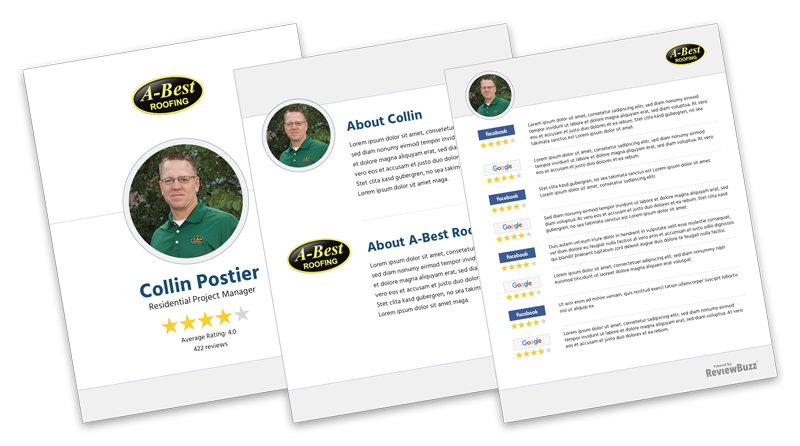 The ReviewBuzz Brag Book aggregates all of the reviews for a given employee and presents them in a printable, company-branded format. It gives the customer more insight into the reputation of your business and makes it easier for the salesperson to close the deal. A win-win for everyone. Aside from the obvious benefit of generating more reviews, which leads to more sales and more revenue for you business, asking for reviews shows your customers that you care about their feedback. That kind of customer service and care leads to more repeat customers — and more money in your pocket. Competition in the service industry is tougher than ever. Everyday you face competitors trying to undercut your prices, copy your strategies, and edge you out of the market. If you don’t develop a way to set yourself apart from the pack, you risk losing business. Fortunately, you have a powerfully unique tool — authentic, positive reviews from your customers that build and communicate trust with your community. Your positive reviews cannot be undercut, copied, or used against you by your competitors. They are the key to differentiate and position your company as the first choice for your customers. Ready to become the first choice for your customers? We can help.